Go easy on the wine, hon. it’s daytime. – Ok, and same goes with the micromanaging! From the previews I gathered that this would be a slightly funny and enjoyable film to watch. Was I in for a surprise! I absolutely loved this film. It is beautifully shot. It has great acting – especially Annette Bening is superb! It’s not about being gay, having a family and having family issues. It’s about having a modern family unit and trying to get this unit to work under difficult times when the structure of the unit is changing. It’s about how a family will unconditionally have your back! 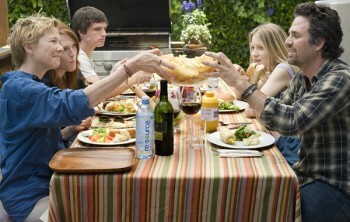 Nic (Annette Bening) and Jules (Julianne Moore) are a married couple in Southern California. Nic is a highly driven doctor, who has a liking for red wine. Who can blame her! Jules drifts from one venture to another while feeling quite restless. They have two teenage children from the same sperm donor. It’s Joni’s (Alice in Wonderland’s Mia Wasikowska) last summer at home before heading to college. Laser (Journey to the Center of the Earth’s Josh Hutcherson), the 15-year old son, wants to track down their biological ”donor dad”. They manage to do this without their moms’ knowledge. 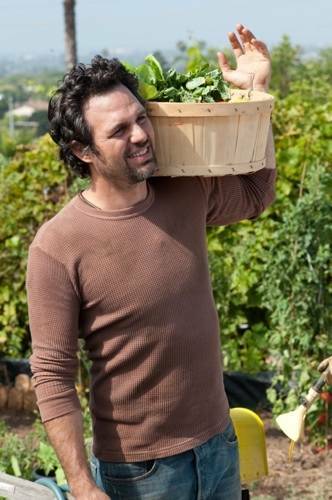 They find a thirty-something Paul (Mark Ruffalo), who is a groovy bachelor restaurateur and a co-op farmer. Growing organic veggies has never before looked this inviting! The moms soon find out and want to meet him and “kill him with kindness”. Jules, who is feeling underappreciated in the marriage and stuck in her life, ends up having an affair with Paul. Those veggies certainly look yummy! 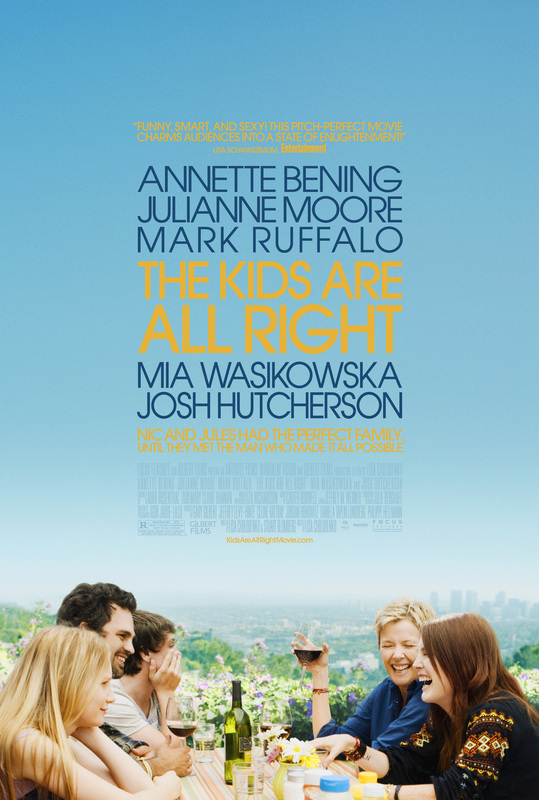 The Kids are All Right explores how the changes in the family dynamic affect the whole family. In this case, Joni’s departure to college is the underlying factor. Julianne Moore says that one of the reasons why she was drawn to the script was that it’s about where you are when you’ve been in a relationship for a long time and you have children. She also describes her character’s life pretty much being about staying home with the kids and because of that for Jules the idea that Joni is leaving home now is major. Annette Bening delivers a powerhouse performance as a slightly neurotic but likeable Nic. She portrays confidently a complicated woman, who knows exactly who she is and is comfortable in her own skin. Bening won a Golden Globe for this and rightly so. The whole movie I was mesmerized about how much she can say only with pauses and facial expressions. Also you have to love the fact that Annette Bening has matured naturally (and beautifully) in this youth obsessed society. I like my wine, ok! So f***ing sue me! Lisa Cholodenko’s and Stuart Blumberg’s screenplay is heartfelt throughout. It gives the opportunity for all the actors to explore their characters in-depth. It deals with modern family issues, which are familiar to all of us. It is emotional, but at the same time funny. I also love Cholodenko’s direction and the camera angles. The Kids are All Right has great scenes, such as the restaurant scene when Nic has a meltdown about composting (right there with her! ), and the dinner scene when Nic and Paul sing a Joni Mitchell song. The most touching scene is close to the end of the movie, when Jules apologizes to her family. I love Annette Bening’s physical response – how you can see her fighting not to cry. I don’t think anybody can watch that scene without tearing up. Hug her – that’s what she is there for!